Koller Gallery is the oldest gallery that is privately owned in Hungary. It is situated in one of the most frequented areas of Budapest. Located in Castle District, this place spreads over 3 floors and has a memorial room dedicated to the famous artist- Amerigo Tot. He was an Italian- Hungarian sculptor and a lot of his work is housed in this Gallery which is named after Gyorgy Koller. Gyorgy Koller was an art fanatic as he also founded the Association of Hungarian Engravers. The quality of this gallery has been the talk of the art realm since time immemorial. The quality of this gallery has stayed intact as it still managed by the Koller family and in the present day is handled by the grandson of Gyorgy Koller. How popular is Kolleer Gallery? People normally club together Calvinist Church and House Of Hungarian Art Nouveau while planning their visit to Kolleer Gallery. We loved the building even before we entered. The artwork exhibited are a great mix of new and old from paintings, photography to sculptures. 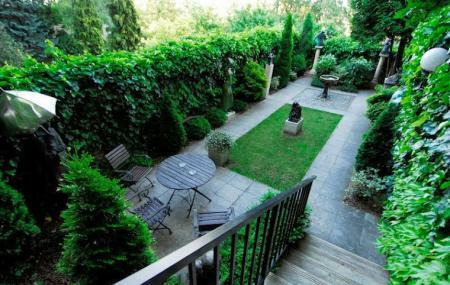 There is a small backyard that's actually a sculpture garden. The famous Hungarian-Italian artist Amerigo Tot lived here too! Entrance is free by the way. Must see, Very interesting place, the garden with sculpture has a lot of charm. The view from the last floor and of course we loved the collection of art they have. We were happy to discover Hungarian artist. Thanks a lot ! Very cool folks running it super friendly. Make sure to ring the bell. View from third floor impressive as an unexpected bonus. Amazing family gallery with a great mix of modern and classic art and sculpture. Free to enter with some limited prints and sketches available to purchase. Better than the national gallery in my opinion! WOW!!! What a beautiful jew in this amazing city. The people gave all details about the pieces available. Extraordinary collection of local artist. Can't wait to come back.